When I am praying for someone who is going through a difficult time, I often pray, “Lord, give them the strength they need to make it through this time.” While this prayer is good, and God understands what I'm asking, I have come to believe there is a better way to pray for them. I was reading some verses recently, and realized that, if we are Believers in Jesus Christ, we already have the strength we need to get us through the difficult times, because the LORD is our strength. 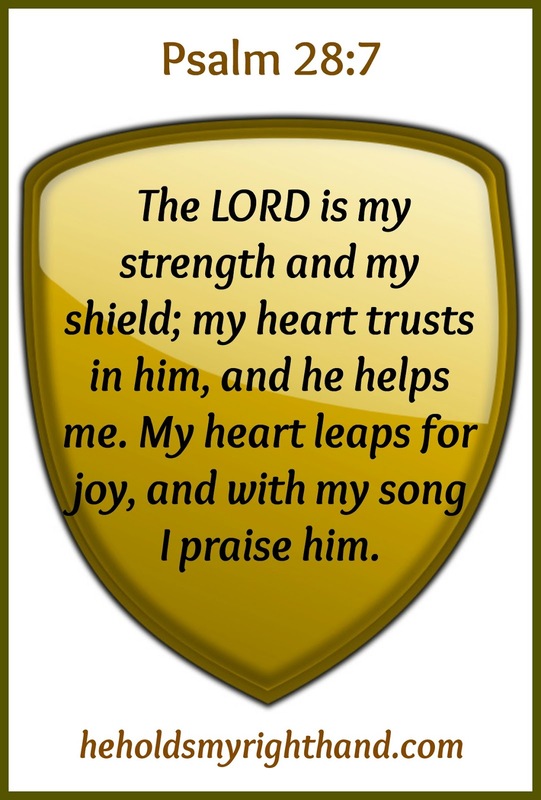 But, just like King David in the verse below, sometimes we need to FIND that strength. Instead of praying for God to give someone strength, I have now started asking, “Lord please help them FIND the strength they have (or can have) in You.” When we lose sight of our strength, the troubles of this world can easily discourage us and weigh us down. It is one of Satan’s tactics of silencing our witness for the Lord. So, when we are discouraged, we may need to change focus in order to FIND our strength once again. How do we FIND our strength in the Lord? 1. By trusting in Him, and not in our own understanding of things. 2. By believing that all things work out for the best for those who love God. 3. By waiting for the Lord. 4. By praising Him. Even when things are hard. Why? Because He is our God and is worthy of our praise. Praising him, with our words and with our songs, helps us to focus on HIM and on the love and care He has shown us. 5. By thinking about the things that are worthy of praise. Refuse to dwell on the negatives. 6. By giving thanks. You don’t have to like your circumstances, but you can choose to focus on the positive things surrounding them, and to be grateful to God for His unconditional love and care for you. 7. By giving your burdens/anxiety to the Lord. Let Him carry them. You have to CHOOSE to do this. He won’t carry them for you unless you place them on His shoulders first. 8. By setting your mind on the things above. By realizing this is not your permanent home. Colossians 3:2 - Set your minds on things that are above, not on things that are on earth. 9. By persevering, realizing our sufferings are helping us to grow in our Christian walk. Romans 5:3-5 - but we rejoice in our sufferings, knowing that suffering produces endurance, and endurance produces character, and character produces hope, and hope does not put us to shame, because God’s love has been poured into our hearts through the Holy Spirit who has been given to us. 10. By running the race set before us, looking forward to the finish line. Isaiah 40:29 - He gives power to the faint, and to him who has no might he increases strength. Isaiah 40:30-31 - Even youths shall faint and be weary, and young men shall fall exhausted; but they who wait for the LORD shall renew their strength; they shall mount up with wings like eagles; they shall run and not be weary; they shall walk and not faint. Psalm 46:1 - ...God is our refuge and strength, a very present help in trouble.